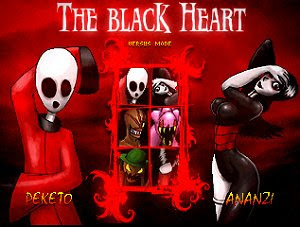 The Black Heart is a fighting game created with the M.U.G.E.N. engine. There are six playable characters to choose from. The game has been inspired by many things. The first one is the Splatterhouse games saga by Namco for Turbo Grafx 16 and Sega Genesis. The idea of a red stained world came from the movie Evildead 2 by Sam Raimi.